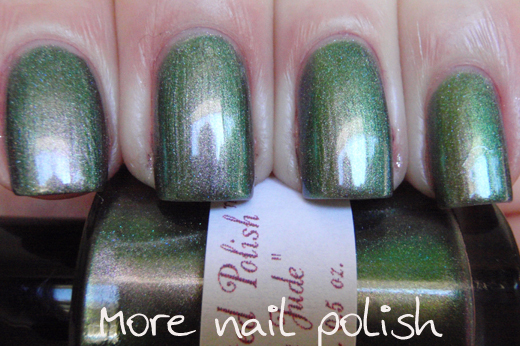 I'm sure most of you have heard of indie brand Enchanted Polish, well today I have an absolutely stunning polish for you. Cheslea has done an amazing job with these polishes and I'm so happy that she has this whole range, because it fills a massive hole in the market that was left when the Ozotic Mish Mash polishes were discontinued. 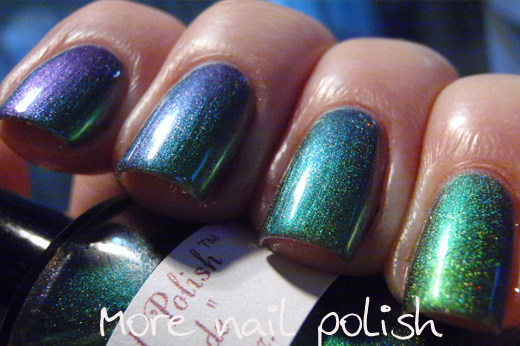 Enchanted Polish has a whole range of multichromatic holographic polishes. Some are the same colours as the Ozotic Mish Mash, but other - like this one - are shades that Ozotic never made as Mish Mash shades. I will eventually get to show you them all! Hey Jude is basically a holographic version of Ozotic 503 or Ludurana Aurora Boreal Brave or Hits Mari Moon Chameleon. The other reason I love these Enchanted Polishes so much is that as well as being holographic and multichromatic, they are opaque enough to wear on their own. Sure you can wear a black base if you want, but for this mani I just did three coats of Hey Jude on its own. I love that I don't have to layer it. The very base shimmer to this polish is actually a tan brown colour, which you can see in my very last photo. But the predominant colour is green, which flips through teal shades to purple. 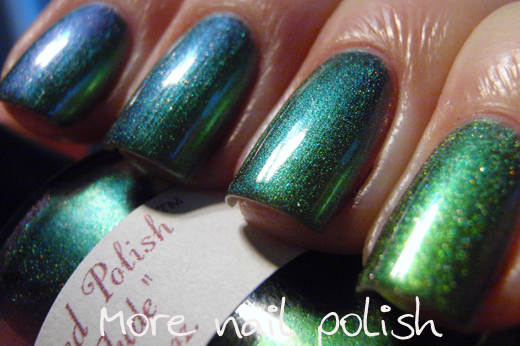 It's hard to believe that so many colours can come from one polish. 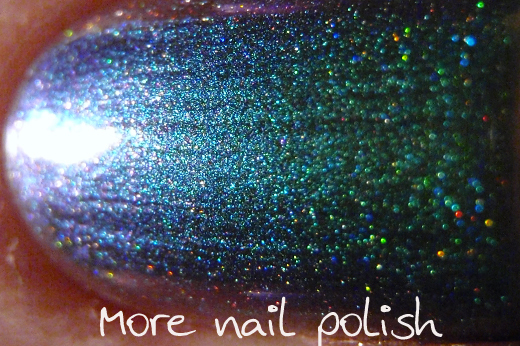 The only thing I dislike about multichromatic holographic polishes is that they are so hard to photograph. 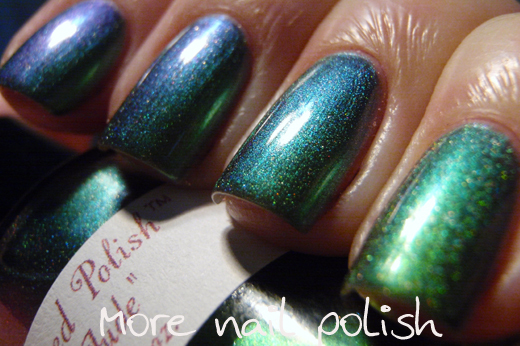 Holo polishes look best in the sun where all their little coloured particles show through. Multichromes look way better in the shade. The best photos are probably achieved in a light box, but I don't have one and I know if I build one, then one of my cats would just sleep in it anyway. So with that caveat on my photos, I present lots and lots of photos of the beautiful polish - Hey Jude. Enchanted Polishes are available from their Etsy Store or from Llarowe and the best part is that they are not limited edition. Whoa. I think I need this. I thought Hey Jude was discontinued. There's also never any in stock anyway at LLarowe (last restock was just the new Beatles polishes I think), and when there IS they all get snapped up so fast it makes my computer tweak. I think I'm just gonna find a different multichrome and put holo topcoat on it. Ugh the lemmings! That polish is insanely awesome!!! Gosh, so many different colours on each angle, very, very pretty! breath taking! I love this!! 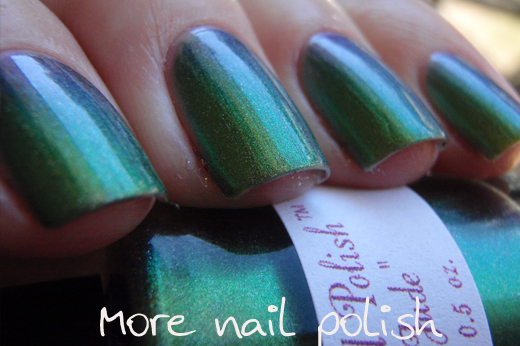 You did an amazing job capturing that multichrome in the first picture! 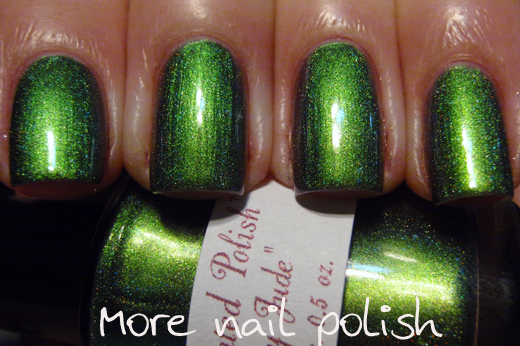 And the last picture is a perfect shot of the polish color. Love my Hey Jude polish! Woah! What a beautiful colour! The range of colours in this polish is absolutely amazing! I love it!